Do you know that there are several risks that can harm your  business and impair the balance sheet? Are you aware that due to global exposure we are moving towards becoming a litigious society hence more risks? Are you aware that as an employee you are also exposed to personal liabilities? 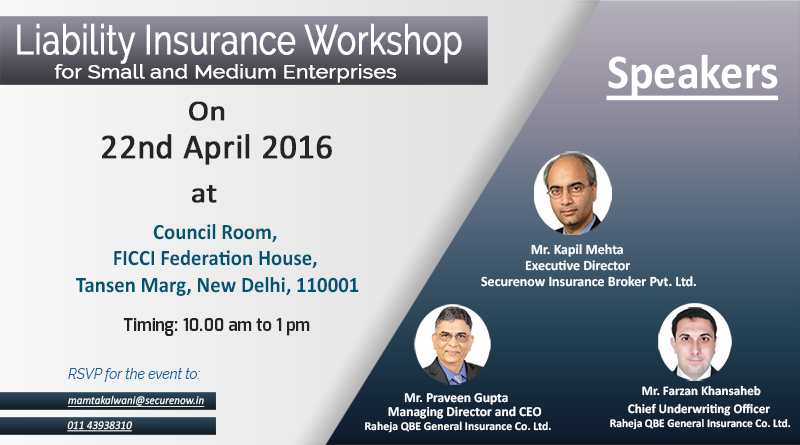 Securenow Insurance Broker is organising an exclusive half-day event in association with FICCI CMSME and Raheja QBE General Insurance on Liability Insurances. Experts in the field will explain liability risks and the manner in which insurances can address those risks. The objective of this workshop is to help SMEs in understanding the liability risks associated with their business and the ways to mitigate the risks and overcome the unknown challenges. Finance Heads / Risk Executives / Business owners who are responsible for their company’s balance sheet.